Are you looking to earn more revenue? Drive more traffic? Want to increase the frequency of purchase or the total Average Order Value? Well, you might have been trying targeted promotions, full page caching, and more, but these processes come as costly to get the increase the sales. 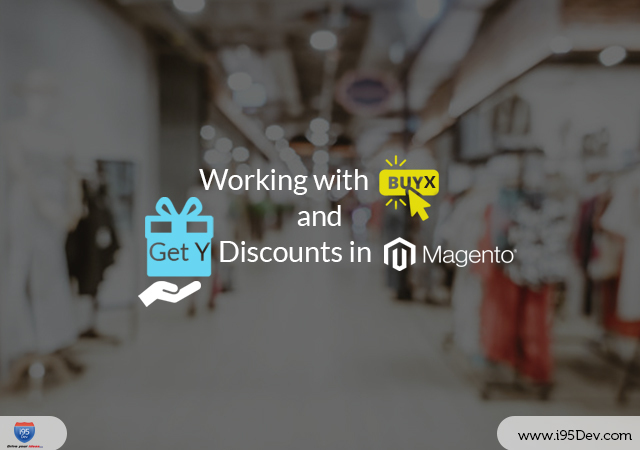 Read here as we walk you through increasing the Average Order Value (AOV) by working with B2C marketing strategies and strategies about working with Buy X and Get Y discounts on Magento. It lets you increase the revenues from your current customer base instead of paying for additional traffic. AOV correlates with both your margin and profit. Your profit increases as the orders go up in number due to the decrease in shipping (free shipping), and other expenses. But what ‘features’ in Magento helps you increase the Average Order Value? Browse through the Shopping Cart Price Rules in your Magento e-commerce store admin interface. Create the new rule in the Rule Information Tab, and from the actions tab, select Buy X and Get Y free from the list. Now, in Discount Amount, enter how many items you are giving for free. In the Discount Qty, add how many X items should be added to receive free Y item. Now, set the labels, and then save the rule. Remember, when you apply this Buy X and Get Y free Magento, it may require a certain amount of time, while it propagates in your store. Refer and Earn Coupons: There is no denying that the word of mouth promotion works best for your products. All you need is to give them the opportunity to refer your store to their friends. For each referral to their friends, give them a coupon code as the store discount, and you are good to go. Coupons on First Purchase: Whether it’s a referral or you have new customers, you can create this coupon to give them a discount on first purchase. However, it works best for the business owners who have just started a new business. Give Them Percentage Off: Percentage Off coupon works when you offer them some percentage off on their next order. It also works best in the case of Average Order Value as you can give the off for the product that has a lower cart value. The percentage off can be applied by giving 10% off on next order or a percentage off on some minimum cart value. Coupons for a Day: The daily coupons work when you have a deal or sale on a specific product for a day. Use a Miss You Coupon: There are times, when a customer buys from you, but never comes back. Regardless of the reason, send them a miss you coupon and let them buy from you. But how do these coupons will reach to your potential customers? Well, according to Choice Behaviors Insights Study, a consumer sees 3,000 advertising messages per day. To stand out, you can share the coupons through legitimate social media channels, newsletters or you can share them with the ones who have abandoned your carts. Host Engaging and Creative Contests to increase the order value and maintain the brand-customer relationships. Leverage the Power of Membership Programs: All you need to do is separate customers via membership programs and then send exclusive awards to them. 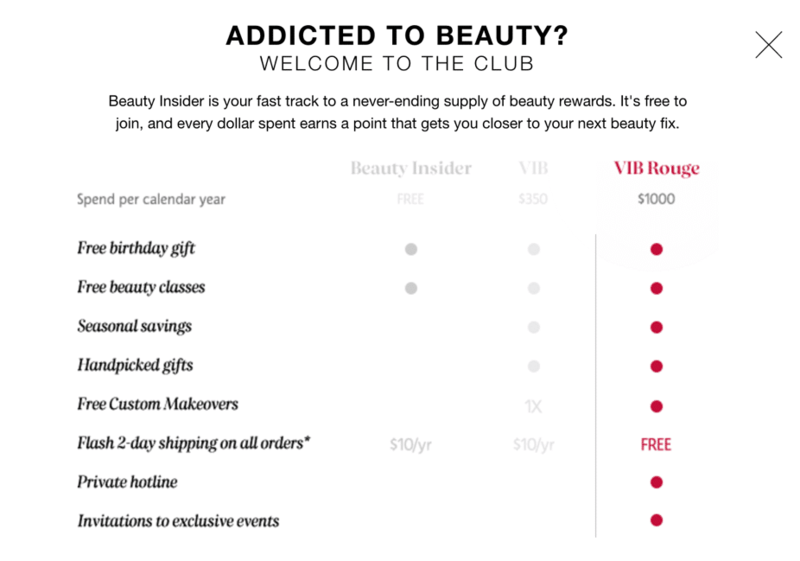 Source: EmarsysFor example, Sephora has a membership program, which is known as Beauty Insider. This program separates customers into three tiers, and each tier has its own awards. However, the highest tier, VIB Rouge is so effective that it actually persuades customers to spend more to reach that threshold. Retarget the Abandoned Carts through cookie driven re-targeted ad campaigns, triggered emails, and other measures that make abandoned carts hard to ignore. So, whether you use coupons or the above B2C marketing strategies, they are sure to help you increase the Average Order Value. Can B2B and B2C Adopt Marketing Strategies From Each Other? Whether it is a B2B marketer or B2C, both are keeping pace with the customers and are trying to cater to the customer’s changing habits. But B2C marketers have in impression about B2B that they have a funnel centric approach, and B2B marketers consider that B2Bs marketing approach consists of images and flair. However, they can both learn from each other and excel in the skills in which they lack. According to her, the B2C marketing strategies focus on getting an emotional response from the audience, and they focus on the benefits of the products rather than features. Hence, B2B markets can follow the same approach. B2B marketers can also learn gamification from B2C. Regardless of what you are selling, you should have fun and engaging as it lets the customers stay with you. So, with this, it is safe to say that B2B and B2C can get marketing strategies from each other. It comes as no surprise that marketing to increase the Average Order Value comes as a daunting task on its own. Irrespective of the strategy and marketing channel you use, it should show your company’s vision. The ‘Why’ and the main motto of your brand should reach to them. It lets them identify you as a company, an entity on whom they can trust, and the service providers on whom they can always look up to. Did you know that your B2B customers are essential in reaching your B2C clients? They are the customers who are actually interacting with your customers on the ground level. So, whether they need a website or a personalized strategy, give the tools to them so that the customers can come to your business. Before you implement your marketing strategy, make sure that you are leveraging the most from social media. Use it to strengthen your vision, promote products, features, and then the final marketing strategy. It allows them to see the company’s vision in action and will also let the customers trust their services. Offer Free Shipping: It can be site-wide or on some specific products and categories. Give Quantity Discounts: The more they buy, the more they will save. Apply BOGO offer: The customer can buy one product and save on other product. Use Reminder Emails: They are a great way to connect with people and will always help them to remember about your brand. Add A Free Offer With Purchase: According to a 2013 study, Harris Interactive found that the free offers increase the purchases dramatically. Along with these promotional activities, you can build micro influence relationships, invest in mobile-first marketing or host contests like ‘Frito Lay’ does. Now that we know the role of offers and promotions in increasing the Average Order Value, we’d like to share some powerfully simple promotions that have worked for our customers. 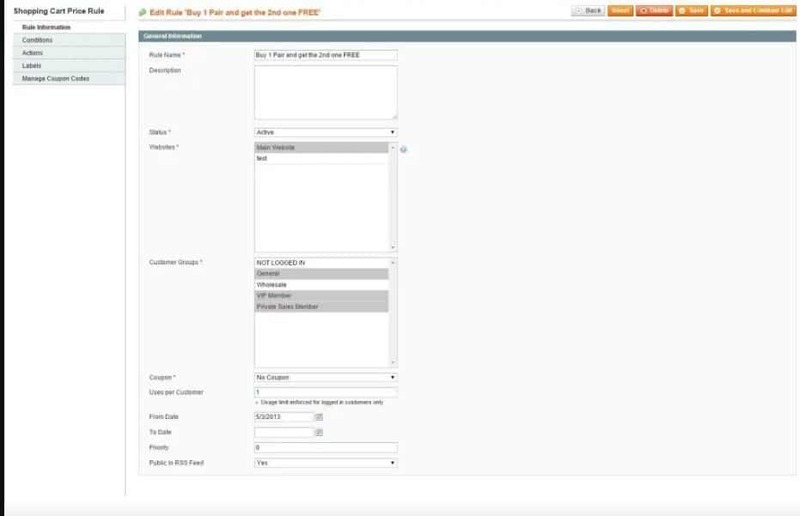 However, when it comes to generating the coupons, Magento allows you to create a specific batch of coupons. However, these cannot be configured according to various offers. i95Dev can help customize the coupons for the online store owner. Regardless of the type of coupon you want, we will help you customize it. Well, these days, the online consumers are tech-savvier than ever. With hundreds and thousands of buying options available, it now takes an additional effort to get your visitors to complete the transaction on your website. We have listed various B2C marketing strategies above including coupon codes, buy X and get Y free Magento, creating creative contexts, free shipping, re-targeting, and lot more. However, only your e-commerce promotions are one of the most valuable persuasion tools available to you. Combine buy X and get Y free Magento with other B2C marketing strategies, and increase your Average Order Value.